OMG Posters! » Archive "Sustain: No Fin No Future" Art Print by Dave Kinsey - OMG Posters! A new art print by Dave Kinsey just popped up as “Available Soon”. “Sustain: No Fin No Future” is an 18″ x 24″ screenprint with an edition of 175. It is part of the same anti-finning print show as Klausen’s, Roper’s, etc. If you want one, keep an eye on the site over the next few days. Visit BlkMrktGallery.com. 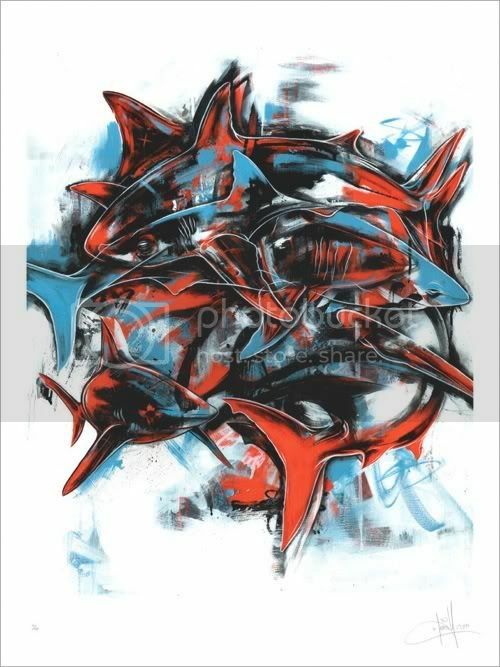 Another great piece of art that says, “F’ you!” to the Shark Fin Mafia. If you haven’t seen the award winning documentary “Sharkwater” check it out, it will blow your mind. THESE ARE UP NOW!!!! GET ONE QUICK!! These are on a first come basis and will be shipped from Japan. Don’t miss this chance to own such a special print. Your purchase will go to help save sharks and raise the awareness levels of shark conservation. Save our sharks, save our seas, save ourselves!